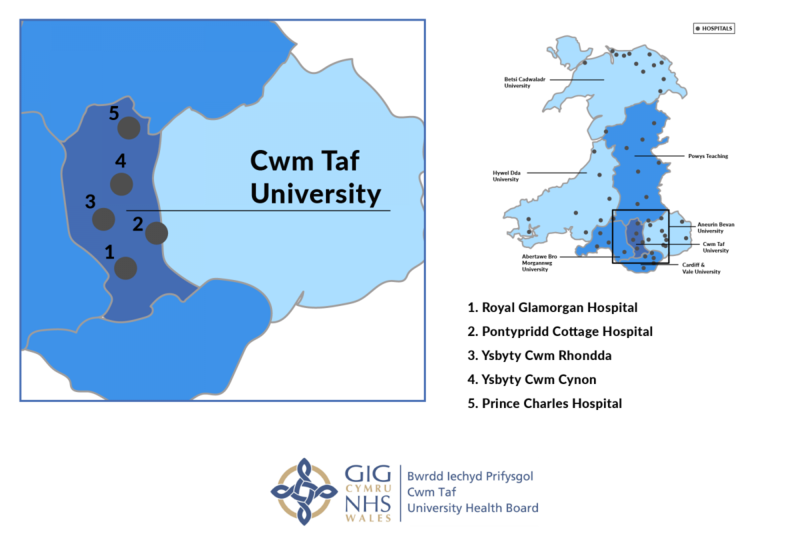 Cwm Taf University Health Board provides services to 300,000 people in Merthyr Tydfil and Rhondda Cynon Taf. With almost 8,000 staff and the motto ‘Cwm Taf Cares’, the health board is committed to staff health, wellbeing and development and holds the highly coveted Platinum Corporate Health Standard. Cwm Taf has an Academic Centre in Merthyr, where future doctors in community medicine are trained, and is the best-performing health board in Wales for ambulance handover times within 15 minutes from arrival at A&E. The 400-bed Prince Charles Hospital on Merthyr’s Gurnos Estate has a busy A&E department and provides acute and elective medical care and surgery. Its services include intensive care and coronary care, consultant-led obstetrics services with a special care baby unit and inpatient consultant-led paediatric medicine. The hospital is a centre for sub-regional oral and maxillo facial services, has a full range of specialist outpatient services and provides an extensive range of diagnostic services and facilities, such as CT and MRI. The Royal Glamorgan Hospital near Llantrisant replaced the old East Glamorgan Hospital at the turn of the millennium. With around 545 beds, it provides many inpatient, day case and outpatient facilities, together with A&E and diagnostic facilities. It has an acute medical unit and also an acute mental health unit, and provides a range of critical care services including ICU, high dependency, special care baby unit and neonatal intensive care. It also has modern pathology and radiology services. Specialisms: Cwm Taf and Macmillan Cancer Support are working in partnership to build a £7m eight-bed, state of the art palliative care inpatient and day centre at the Royal Glamorgan. Location: Ynysmaerdy, Llantrisant, Pontyclun CF72 8XR. Y Bwthyn Cottage Hospital in Pontypridd provides palliative care for inpatients, outpatients and day patients. The six-bed hospital is also a base for Macmillan nurses. The service is due to be transferred to a new centre called Y Bwthyn at the Royal Glamorgan Hospital, where patients will be able to receive care on the same site as undergoing tests and treatment, to reduce the distress of travelling. There is also an Elderly Mentally Ill (EMI) day unit at Y Bwthyn. Specialisms: Palliative care for cancer and other conditions. Ysbyty Cwm Cynon opened in 2012 and has a minor injuries unit, maternity facilities, x-ray facilities, six rehabilitation wards, older people’s mental health services, children and adolescent services, therapies and palliative care. It also houses an out of hours GP service. Specialisms: A dental teaching unit is based at Cwm Cynon, as is the Community Drugs and Alcohol Resource Centre. A new 108-bed community hospital with an integrated primary care centre, Ysbyty Cwm Rhondda replaced the former Llwynypia hospital. It has four 27-bed rehabilitation wards, a minor injuries unit, radiology, pharmacy, therapies and an outpatient department, as well as an out of hours GP service.